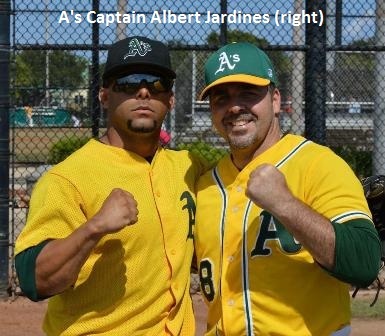 Our win was bitter sweet as the A’s lost their long-time team captain, Albert Jardines to cancer two weeks ago. Although, he was still with us at the time of the tournament, the games were all played with his jersey hanging in our dugout. For the fifth time in team history, the Coral Gables Athletics won the MSBL Holiday Classic. Playing in its first 30+ age bracket in this tournament, the A’s swept the round robin defeating the Brandon Bombers 14-4, Cleveland Sports Fever 7-2 and Rhode Island Sea Dogs 10-7. They then defeated the Chicago Woodpeckers 5-3 to advance to the championship game versus the Bombers, which would prove to be memorable. The Bombers took an early 1-0 lead on the A’s in the first but the A’s responded with a run in the third when Jose Zababa drove in Juan Quesada for the A’s first run. The teams swapped runs in the fourth as Luis Cabral drove in the A’s second run on a sacrifice fly. The Bombers took the lead on a home run in the fifth, as the game would remain 3-2 until the dramatic bottom of the ninth. This was the second championship the A’s have won in walk off fashion as they won the 2011 Fall Classic in 10 innings on a walk off. Alex Arteaga started for the A’s and went seven innings, striking out five. Jared Bahnsen earned the win in relief going the final two innings without surrendering a run. Tournament Highlights: Jose Zabala led the A’s with 10 hits and went 2-4 in the championship game. Alvaro Gomez had eight hits. Amed Martinez led the team with eight runs scored. Andres Vengoechea had seven RBI on the weekend. Jaime Cruz and Willy Mizrahi picked up wins in the round robin. Justin Jordan pitched a complete game in the Semi-Final win over the Woodpeckers. Special Note: This might have been the toughest tournament the A’s have ever and will ever play. Their long time team captain, Albert Jardines could not join the team as he was battling his final days with cancer before passing away on January 30. Albert has been playing with the A’s for the past 20 years, actually joining the team for the 2001 MSBL Holiday Classic being a critical part of this team’s success for all of these years. He leaves behind a beautiful wife, Ileana and two young daughters Emily and Sofia. He will be dearly missed by all but will always be present in our dugout!